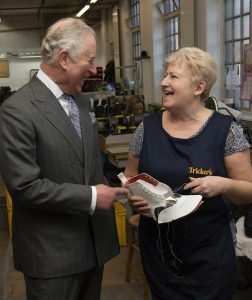 On Monday, 28TH January 2019, HRH The Prince of Wales visited the Tricker’s factory in Northampton. 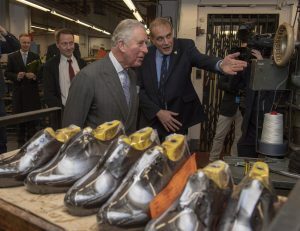 During the visit, The Prince was given a tour of the factory by MD Martin Mason and master bespoke shoemaker Scot McKee. 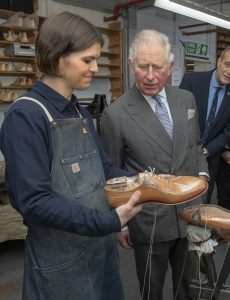 He met the apprentice bespoke shoemakers including Adele Williamson, who is a QEST (Queen Elizabeth Scholarship Trust) scholar. His Royal Highness is a huge supporter of encouraging young people to consider manufacturing as a career option. Tricker’s has held a Royal Warrant since 1989 and the visit highlights The Prince of Wales continued support for British craftsmanship and manufacturing. Established in 1829, Tricker’s Ltd. is the region’s oldest shoemaker and celebrates its 190th anniversary this year.